Having heard so many good things about Nightcrawler, I finally had a chance to watch the neo-noir thriller this past week. Sporting a whopping 95% approval rating on Rotten Tomatoes, Nightcrawler delivers a riveting, intense, and unforgettable performance by Jake Gyllenhaal. Top-notch script and acting aside, the movie's setting ... the City of Los Angeles ... is another central character in the movie. Nightcrawler is the first film since (my personal favorite) Drive to take us on a memorable roller-coaster ride around L.A. after sundown. — Jake Gyllenhaal on filming Nightcrawler in Los Angeles. Screenshot from Nightcrawler of an establishing shot of a Los Angeles street at night. The movie centers around Louis Bloom (Jake Gyllenhaal), a driven, ambitious unemployed young man who's obsessed with making it big by working his way into the murky, graveyard shift of L.A. crime journalism. Much has been discussed about Gyllenhaal’s Oscar-worthy performance and his fierce, sunken Betty Davis eyes which seem to "have dispensed with blinking …” described The New Yorker. “They glare and they gleam, like the eyes of a man who is minutes away from death, furious with fever, and refusing to slip away in peace.” Like its protagonist, the L.A. world of Nightcrawler is also just as feverish and desperate. Dan Gilroy, Nightcrawler's brilliant director, shows us a side of Los Angeles most tourists rarely get to see. — Kevin Kavanaugh, Production Designer of Nightcrawler. "The varied landscapes of Los Angeles—the fabrics of the different neighborhoods—this city would be more than just a backdrop in Nightcrawler," says production designer Kevin Kavanaugh. "The central character Louis Bloom (Jake Gyllenhaal) would come down from the surrounding hills at night like a coyote looking for whatever scraps he could find to survive, an opportunist who would do anything to be successful in his own deranged mind." Shot entirely on location in Los Angeles, the film locations of Nighcrawler come alive as authentic, pulsing stars in their own right. An aerial view of Mulholland Drive at night - image via Google. Screenshot from Nightcrawler of a scene filmed on Mulholland Drive with the twinkling lights of Los Angeles in the valley below. The panoramic, iconic views of Los Angeles spread out in the distance below is the major reason why Nightcrawler had to film on Mulholland Drive. “... those L.A. lights behind the action - that was always a consideration for every location: making sure we bring the city in to each scene,” said Kavanaugh. "At night, Los Angeles is an island of glowing white noise, alive with energy, in a sea of black." View of Los Angeles from Mulholland Drive - image via Google. Mulholland Drive has also been featured in many movies in the past, including David Lynch’s Mulholland Dr. It was also the film location for LA Confidential and Rebel Without a Cause. Screenshot from Nightcrawler of the crucial scene at Chinatown Express - in real life the restaurant is Pioneer Chicken Restaurant on South Western Avenue, Los Angeles. To not give any spoiler away, all we can say about Chinatown Express is ... it is the crucial setting of one of the major turning points in the movie. In real life, standing in for Chinatown Express is Pioneer Chicken Restaurant located in Los Angeles’s Koreatown. At the time of the filming, Pioneer Chicken was at 252 South Western Avenue (at West 3rd Street). Since then, the restaurant has moved to a new location (928 South Western Avenue, No. 139). In Nightcrawler, Chinatown Express is where Lou plans his ultimate masterpiece finale. “Kevin [Kavanaugh] wanted us to be in Koreatown or Chinatown, an ethnic neighborhood of L.A.,” says location manager Curtis Collins. For the two-night shoot at Pioneer Chicken Restaurant, the production closed off a few blocks of streets around Western Avenue. Screenshot from Nightcrawler of the establishing shot for KWLA-6 Studios, where Nina works. In real life this location belongs to KTLA Studios on Sunset Boulevard. KWLA Studios is the newsroom where Nina Romina (Rene Russo) works. Since the production wanted the newsroom to look like "a third-rate studio that was barely hanging on," described Collins, they used KTLA Studios on Sunset Boulevard as its film location. And in case you're interested in a bit of Hollywood history, the KTLA Studios are next to the Sunset Bronson Studios where The Jazz Singer was filmed in 1927. The exterior and tower of KTLA Studios in Los Angeles where Nightcrawler was filmed - image via Wikipedia. Venice Beach in Los Angeles, CA - where Nightcrawler was filmed. Image via Google. Screenshot from Nightcrawler of a scene filmed on the boardwalk of Venice Beach - featuring Lou Bloom sitting under a tree planning a bicycle heist to pawn for video equipment. For filming, the production actually kept the boardwalk open and shot a few blocks north of Windward Avenue. With a compact crew and about 30 extras blending in with the real-life Boardwalk crowd, filming was done swiftly and inconspicuously, creating an organic and authentic setting for Nightcrawler. 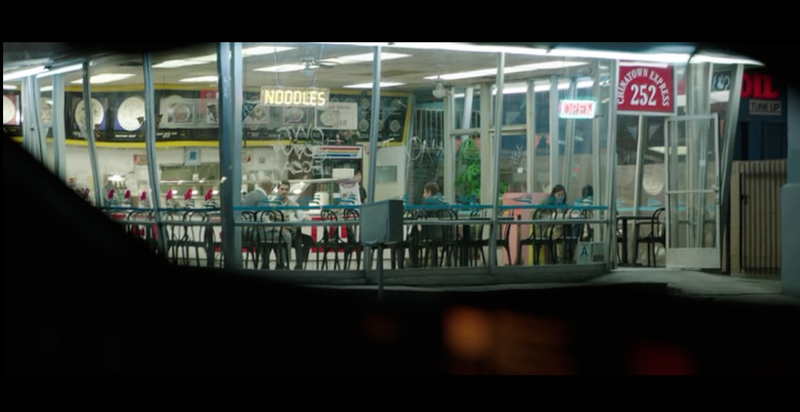 Screenshot from Nightcrawler of a scene filmed at Dinah's Family Restaurant. The wide open windows behind the booth provides a great view of the L.A. life outside - one of the reasons why Dinah's is a popular film location. Two scenes from Nightcrawler were filmed at Dinah's Family Restaurant, located at 6521 S Sepulveda Boulevard: Lou's meeting with Nina, and his interview with his first intern Rick (Riz Ahmed). Even though Lou isn't yet a real businessman, he tries to be one by holding court at a restaurant. “There’s a comical element to it,” says Kavanaugh. — Curtis Collins, Location Manager for Nightcrawler. Dinah's Family Restaurant with its famous front-facing round windows, a favorite feature for filmmakers. Image via Google. One of the scenes in Nightcrawler shows Lou sitting on top of his car in a parking lot in front of Angelino's Bakery on Sunset Boulevard listening to the police scanner as they wait for a crime to enfold. Screenshot from Nightcrawler of a scene filmed in front of Angelino's Bakery on West Sunset Blvd - featuring Lou Bloom sitting on top of his car and Rick (his employee/intern) sitting inside the car - both waiting for a crime to happen so they can be first to cover it. Located at 1522 West Sunset Boulevard, by the strip mall at Laveta Terrace in Echo Park, Angelino's is a popular local bakery, well loved for its delicious croissants, donuts, smoothies and coffee. Kavanaugh says that location scouting for this type of night scene needs to be done at night because in the daytime, the same location usually doesn't look as dramatic. "I was washed ashore in the ebb and flow of the city at night," says Kavanaugh. "These intersections, neighborhoods, 24-hour laundromats, late-night taco trucks and Korean BBQ stands would be the sets and locations—and characters—for this film." The parking lot of Angelino's Bakery is one of the film locations for Nightcrawler - image via Google. — Kevin Kavanaugh, Production Designer for Nightcrawler, on filming in Los Angeles. Screenshot of a scene from Nightcrawler filmed at the Studio City Shell gas station. After a few successful runs documenting Los Angeles's nightly crime scenes, Lou makes enough money to purchase a brand new and much faster car (a shiny, red Dodge Challenger) to help him do his job better. The first scene in which we see his new car was filmed at the Studio City Shell Gas Station located on 12007 Ventura Boulevard in the San Fernando Valley. Lou's employee Rick just finishes filling-up gas when he gets a lecture from his boss for spilling gas onto the car. Across the street from the gas station is Du-par's, an all-night restaurant featured in Boogie Nights. By the way, if you ever want to gas up your car at a famous L.A. film location, here's the Studio City Shell Gas Station's Facebook page. Screenshot from Nightcrawler filmed at El Compadre Restaurant (in the movie it stands for the fictitious Cabanita Mexican Restaurant. Lou asked Nina out on a date. After much persuasion from his part, she agrees to meet him. Lou suggests that they dine at Cabanita, a Mexican restaurant. In real life, the restaurant for the date scene was filmed at El Compadre Restaurant, located at 7408 Sunset Boulevard (near The Guitar Center) in Hollywood. Opened in 1975, El Compadre Restaurant has been one of Southern California's hot spots for Mexican cuisine. Its trendy location on Sunset Boulevard and its "old world hacienda" decor make El Compadre a local favorite. You may even spot a celeb or two at this famous Hollywood hangout. Laurel Canyon Boulevard - photo via Flickr. First-time writer-director Dan Gilroy had no qualms about including a heart-stopping car chase sequence into Nightcrawler. The movie joins an impressive list of action flicks world-famous for their car chasing scenes (to name a few ... The French Connection, The Road Warrior, The Bourne Identity, The Matrix Reloaded, and The Fast and Furious franchise). The 10 blocks on Laurel Canyon Boulevard where Nightcrawler was filmed. Map via Google. — Dan Gilroy, Director of Nightcrawler - on filming in Los Angeles. The 10 blocks on Laurel Canyon Boulevard chosen for the filming worked out perfectly for Nightcrawler. This section of Laurel Canyon is wide and straight, giving the production a lot of room to plan the car chasing sequence. “That stretch worked for us because it’s a wide boulevard, and since we were shooting through the windshield, we wanted to be able to see as much of the visual information on the sides, rather than on a narrow street, where you felt like you were going down a canyon,” said Gilroy. “We wanted information to be coming in quickly from the sides, whether it was a car or something else.” The result is a series of amazing action shots culminating in one of the most suspenseful and shocking scenes in the movie. Screenshot from Nightcrawler of Lou Bloom as he exits the police station - filmed at the real-life LAPD Hollywood Station. A scene in Nightcrawler shows Lou leaving a Los Angeles police station. 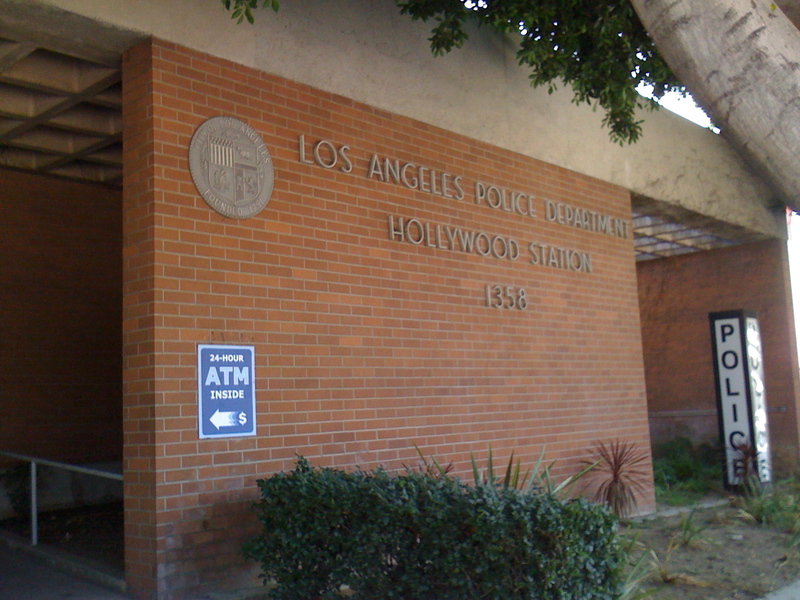 This scene was filmed at the actual LAPD Hollywood Station located at 1358 North Wilcox Avenue. As Lou crosses the street after he exits the LAPD, we see the Hollywood sign in the far background of the shot. Nicely framed. Screenshot from Nightcrawler of Lou Bloom crossing the street after he leaves the police station - the Hollywood sign in the far background quietly reminds us of Los Angeles as the other main character in the film. The LAPD Hollywood Police Station plays itself in Nightcrawler - image via Google. Here's a YouTube video clip of the LAPD where Nightcrawler was shot made by Urban Shark Productions. Los Angeles is a major character and setting for Nightcrawler so it's not surprising to hear that the location scouting process was somewhat more challenging than usual. "I found that each of us has a unique story of why we are here in Los Angeles .... I realized that to understand this city and this film, I had to look past the endless streets in order to find the real fabric of Los Angeles," shares Kavanaugh. "Re-discovering the neighborhoods, people and places became the spark that ignited the design process. Sometimes you just need to get lost." Screenshot from Nightcrawler of a scene at the beginning at the movie at the train track with the Los Angeles skyline twinkling in the background. — Kevin Kavanaugh, Production Designer of Nightcrawler - on location scouting in Los Angeles. For more information in filming in California, visit the California Film Commission.